The stage is set at Miranda’s Water Ski School at Lago Los Morros, Commune San Bernardo, Chile for the 2018 IWWF World OverPreview-35 Waterski Championships. 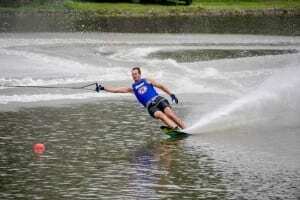 Over 180 skiers from 24 countries are registered to compete in 4 age categories: Over-35, Over 45, Over 55 and Over 65. Team USA has entered over 70 skiers, the biggest number. 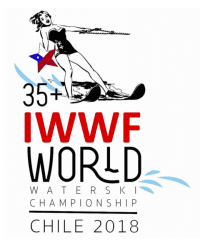 The women include 1995 IWWF World Open Women’s Jump Champion and former World Open Women’s Jump Record Holder Brenda Nichols (USA) and Joy Kelley, former Open Team USA member, who returns to defend her Over-55 Slalom, Jump and Overall titles. Among the men are former IWWF World Cup Men’s Slalom Overall Champion Jodi Fisher (GBR), 1998 US Masters Jump Champion & current top ranked Open Men Jumper Scot Ellis (USA) and Jimmy Siemers (USA) 2018 Moomba Masters Trick Champion, 2003 IWWF World Open Men’s Overall & Trick Champion, 2005 IWWF Open Men’s Overall Champion and former World Open Men’s Jump & Overall Record Holder. 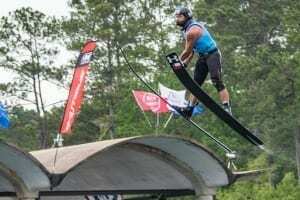 Chile’s Rodrigo Miranda, a current top-ranked Open Men’s jumper competing in his first IWWF Over-35 Worlds, will be looking to win his first IWWF World title. The 2018 IWWF World Over 35 Waterski Championships will be exclusively towed by the all-new Ski Nautique.